On November 22, 1978, Danny O’Neill picked his first batch of coffee beans in the mountainous coffee-growing region around the Poas volcano while studying abroad in Costa Rica. Fifteen years later, when Danny founder The Roasterie in his basement in Kansas City’s quaint Brookside neighborhood, it just made sense that he would partner directly with farmers and pay above-market values to get the best of the best coffee beans. One of the most renowned specialty coffee roasters in the nation, The Roasterie stands apart from other specialty and direct trade coffee companies. 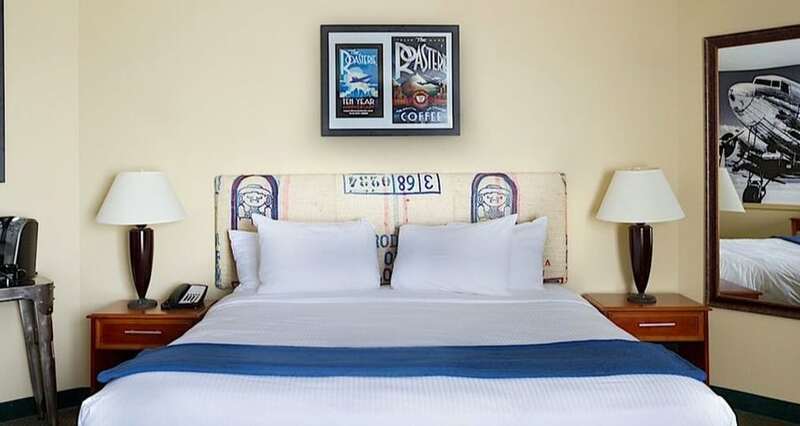 This room features original photos of the founder’s trips and curtains and headboard made from used coffee bean bags.